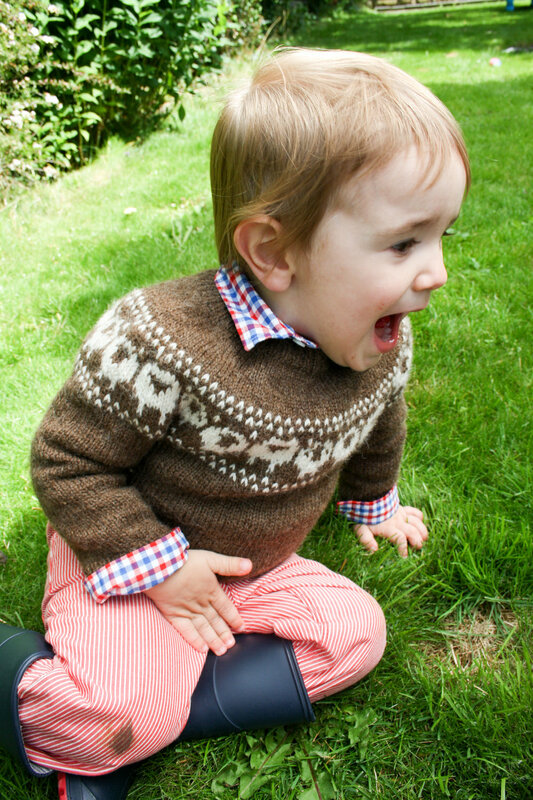 Wee Sheep Sweater — Freehold Yarn Co. These perfect sheep the much loved companion of any child. With the light and almost silky Jamieson & Smith Shetland Heritage Naturals, we have made it a little more rugged by holding it double (please double yardage). For a more luxury sweater, we’ve picked up some John Arbon Textiles - Knit by Numbers (merino) which is fully and soft, perfect for sensitive skin or little ones. The slightly smaller gauge of the pattern is very forgiving for beginners of stranded knitting, but pick colours with a good deal of contrast for the best result. Pick a unisex colour combo and you’ll be sure to have a sweater that ends up ragged with years of wear from many different children as it becomes an adorable favorite. Top down with circular yoke, seamless design, increases are in single colour rows only making ease of knitting and fitting! and Dark Grey (CC) Jamieson & Smith Shetland Heritage Naturals. Please note: Some sizes may require magic loop/traveling loop, 20 cm circular needle or double pointed needles. Pattern is provided as a .PDF file which will be emailed to you via Ravelry (no account required) and are processed separately to yarn orders. If you would like a physical copy please email us.